Play some Ludo, Snakes & Ladders, or carrom with your squad while you munch on Lebanese, Chindian, and Continental bites. PHEW in BTM is hangout goals. The fact that South Bangalore peeps don’t need to brave the traffic to get to the other side of town to chill is what we love about PHEW. This quaint little cafe with its 20-odd seating space is perfect for you to check in with your squad after a long day at work or those cash-strapped weekends. Board games such as Ludo and Snakes & Ladders will keep you and your mates occupied for hours to end and also bring back those childhood memories of everything from desperately praying that your piece doesn’t land on a snake to getting a ‘6’ on every throw. There’s a carrom board as well where you can get your hands all powdered and nails all chipped. The menu here is quite wild in the sense that it doesn’t stick to one kind of cuisine. Falafels, pasta, momos, and even sizzlers all make it to the menu as well as your table. 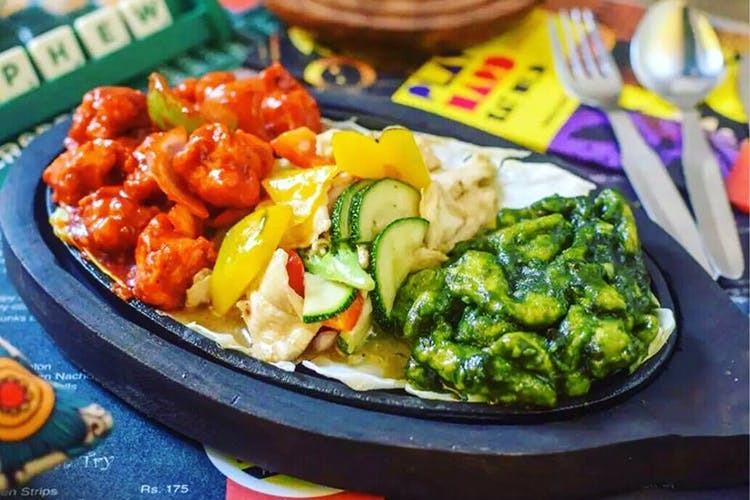 Our pick off the menu includes the Chicken Pita Pockets, Momos Platter that’s perfect for a group as you get three sets of four different momos, the greasy Onion Rings, and the classic Honey Chilli Potatoes. If you’re looking for something heavy, might we suggest the sizzler meals and pasta? They also do salads, guys! The beverage menu comes with the usual tea, coffee, iced tea, and mojito options. The non-alcoholic sangria is a refreshing drink with the pomegranate, apple, and orange flavour hitting the sweet spot — a must-try we say.